These works are presented here to provide an introductory overview and to demonstrate a long-term commitment to the medium of photography. They should not be construed as defining the current or future directions of the work. All site content © Charles Silver all rights reserved. I first met Taktser Rinpoche in 1975 and attended his classes on Tibetan Culture from 1976 - 1979 and 1980 - 1981. He and his family were on sabbatical in Japan during most of 1979. In 1978 I traveled along with him and a group of his students to Madison, Wisconsin to greet His Holiness the Dalai Lama during his first brief visit to the U.S. 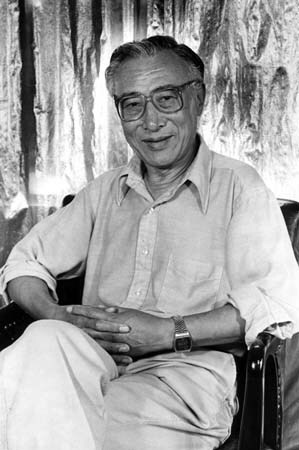 In 1980 after thirty years in exile he visited Tibet at the invitation of the Chinese government. He carried with him into Tibet 108 prints I made from a portrait of him that I had taken. He had requested the portrait and photographs so he could pass them out during that heartbreaking trip. Along with many others I helped sow the grass seed, set sod and plant the evergreen seedlings at the Tibetan Cultural Center which has since been renamed The Tibetan and Mongolian Buddhist Cultural Center. I helped make tsa-tsa for the Jangchub Chorten and attended every TMBCC event I could when I still lived in Bloomington. I was never one to impose upon him but I have maintained as much contact with Rinpoche as possible since leaving Bloomington in 1988. I always offered my skills in service to him and will always continue to offer my skills in service to Kunyang and to the Center. His spirit lives on within all who knew him. His teachings are among the most meaningful I have ever received. If I have ever done any good in this world then it is Rinpoche who should be thanked. His compassion and wisdom guides me and informs my respect for the Dharma and the studies of the full range of mystical and spiritual traditions that comprise much of my life and a good portion of my current photographic work. This past week I spent four days in Bloomington. On Tuesday I visited with Kunyang-la at "Kumbum West". 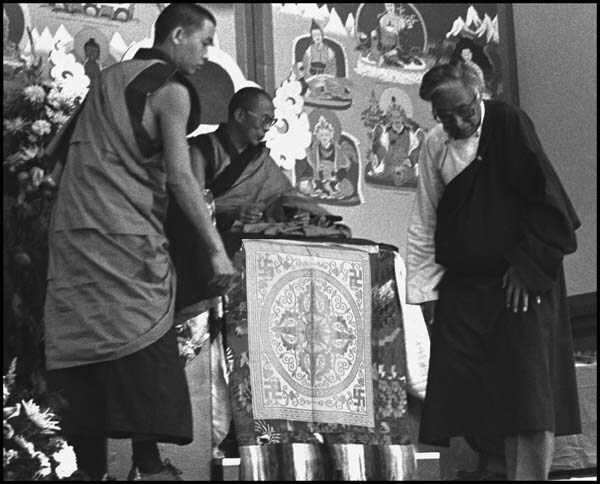 I presented her with several photographs including a very rare one of HHTDL and Rinpoche from the Rainbow Cord ceremony performed for Rinpoche during HH's first visit to the Tibetan Cultural Center at the dedication ceremony in 1987(see below). Tuesday I also helped prepare the mud bricks for the crematory stupa and did some photos of the preparations. Wednesday I attended the public visitation at the monastery. Visitors were given silk prayer scarves and escorted one at a time into Rinpoche's room to offer respect. A group of monks prayed and chanted the Bardo texts as each visitor entered, prostrated and laid a scarf at Rinpoche's feet. Rinpoche was sitting in an upright meditation position dressed in colorful silks with a head dress representing the Buddha families. On Thursday I was deeply honored to be invited by Kunyang-la to attend the private family ceremony and funeral rites for the 23rd reincarnation of the beloved Taktser Rinpoche. We now await the birth of the 24th. I am very inspired and once again thinking about my wish to document the growth of Buddhism in North America as my schedule and resources permit. I am also hoping my schedule will permit me to participate in the Rangzen - ITIM - International Tibetan Independence Movement's 2009 March for Independence for Tibet. I encourage everyone to learn more about Rinpoche and his struggle for Tibet and to help support his cause by becoming involved with the Rangzen-ITIM and the TMBCC.